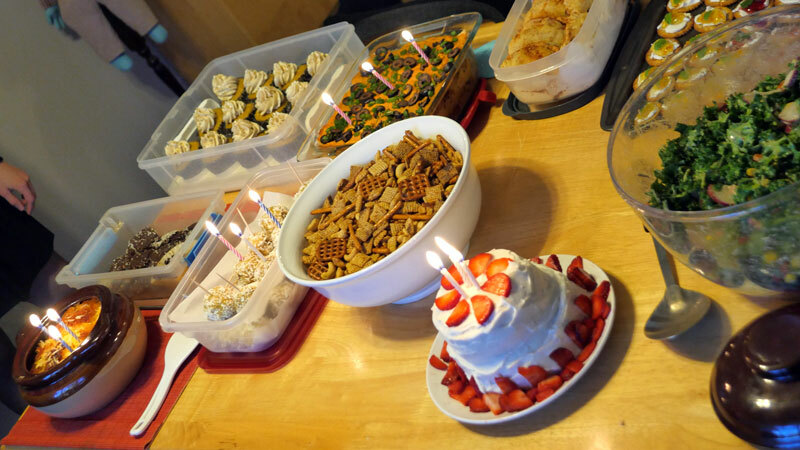 For our March 2016 meeting we celebrated three years of Vegan Bake Club meetings by sticking candles in some of the food and sort of getting dressed up. 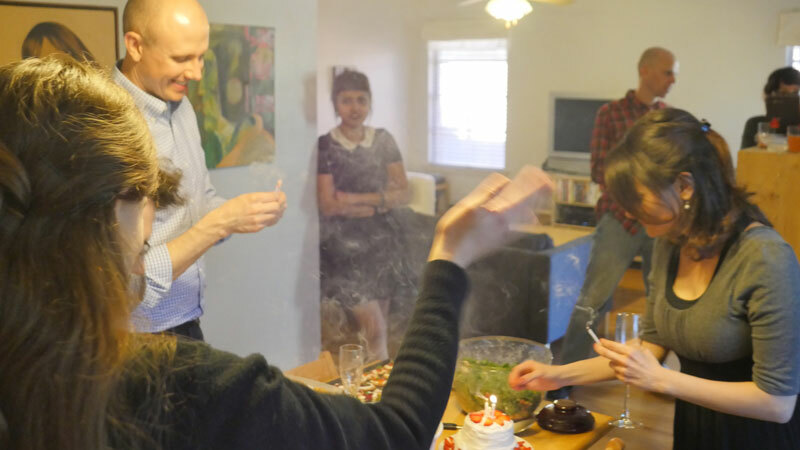 Slynn had picked up trick candles which turned out to be a bit smoky, but all the more festive. 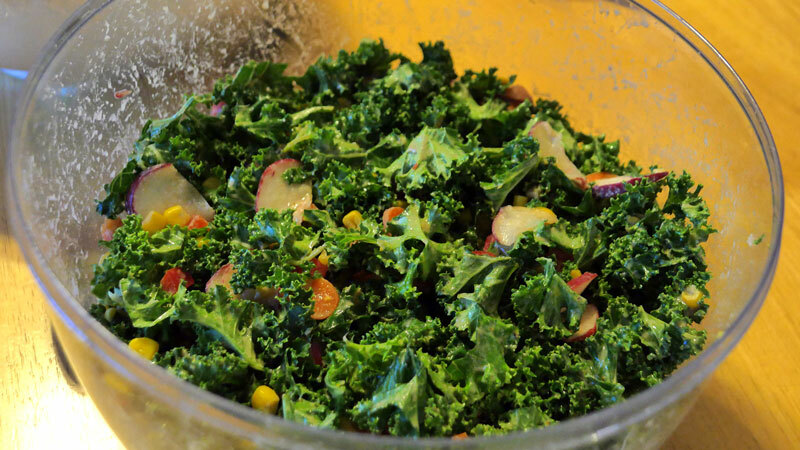 Drew made a salad featuring kale, radish, corn, bell pepper, carrot, and a miso tahini maple dressing based on this Simple Sweet Tahini Dressing recipe. 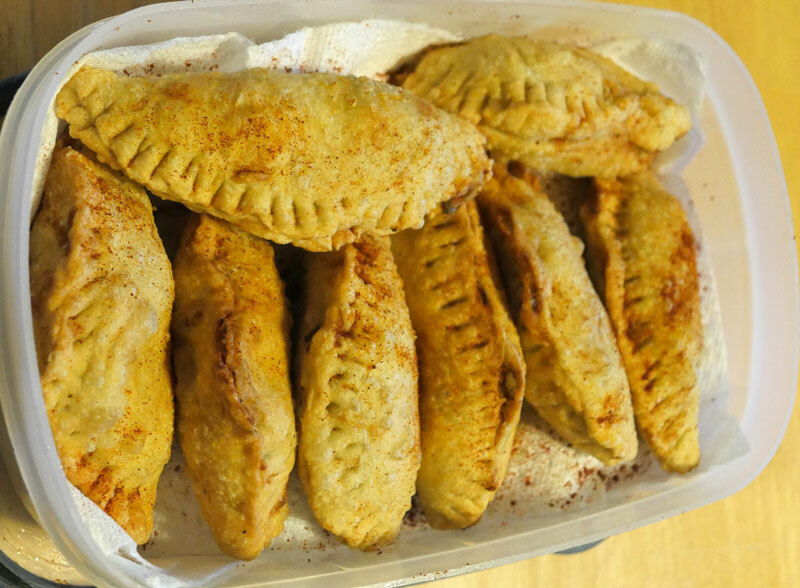 Billy took some leftover homemade lentil and swiss chard soup, blended it with potatoes, wrapped it in dough, and deep fried to create these Selebration Samosas. Being our big three year anniversary, Lilly went crazy with saffron. 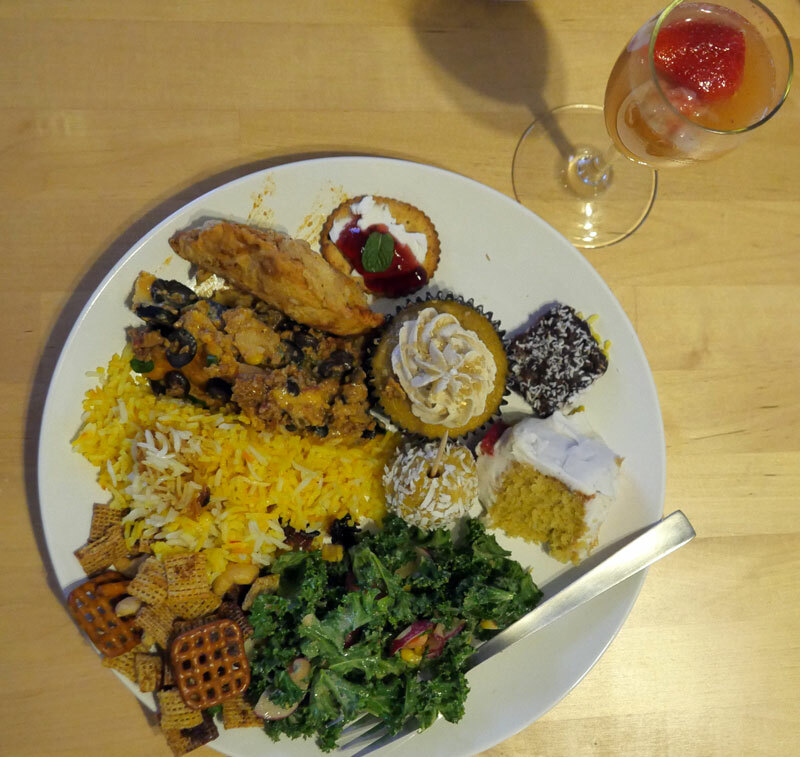 She cooked some white basmati rice that she seasoned with saffron, vegan butter, and salt. 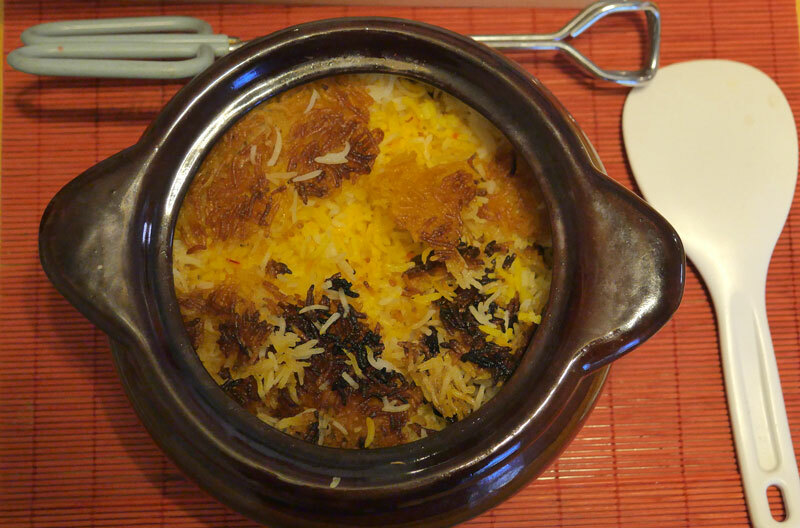 She topped off her pretty pot of rice with tahdig, also with saffron and fried a bit in vegetable oil. For dessert, the saffron fairy melted some vegan Enjoy Life Mini Chocolate Chips, that she combined with toasted coconut milk, unsweetened soy milk, and hand ground saffron. 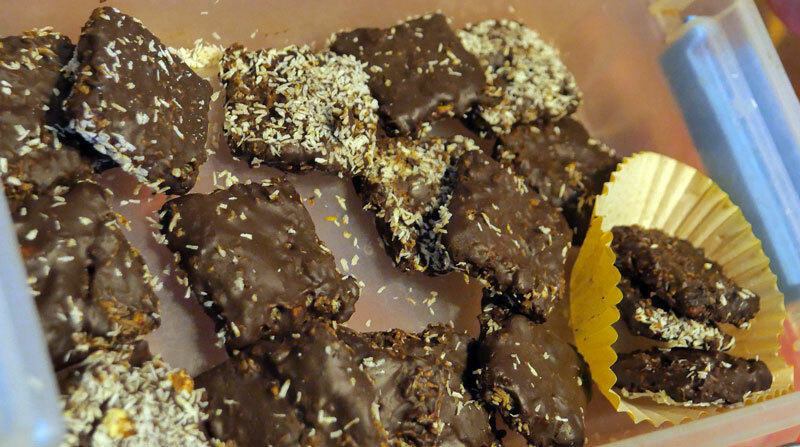 She dipped mini crackers in the chocolate mixture and dusted them with coconut before freezing them solid in preparation of a second layer of chocolate and coconut. 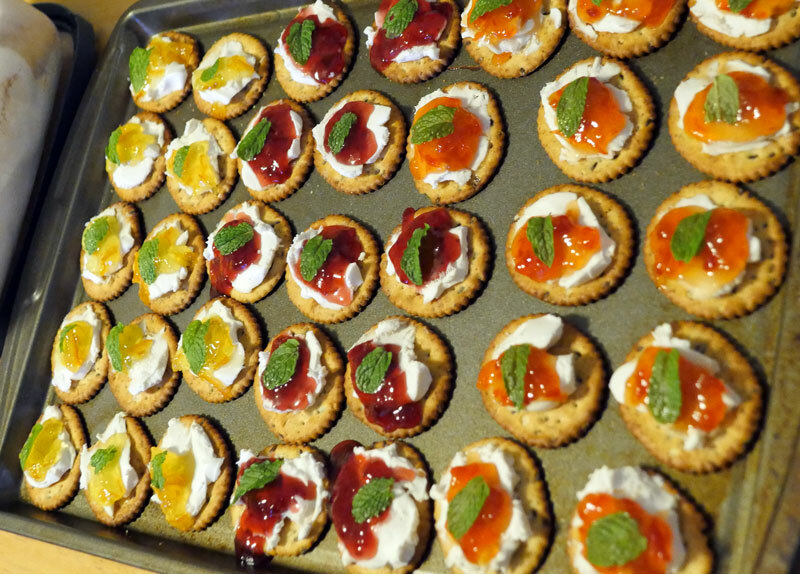 Priya made her fancy cracker appetizer by putting vegan cream cheese on crackers and topping them with a variety of orange marmalade, strawberry preserves, and pear with red pepper preserves. She finished them off with fresh mint leaves. For this meeting, Slynn and Ramon combined their effort to make several goods. For a refreshing beverage course, they provided us with strawberry basil mimosas made with Topo Chico, strawberries, orange juice, fresh basil, agave nectar, and sparkling white wine. Their snack mix course was vegan Chex mix. Recipe included below. Pour Chex, cashews, and pretzels into large bowl. Melt the vegan butter, and add the spices to it. Pour mixture over Chex. Stir well to coat. 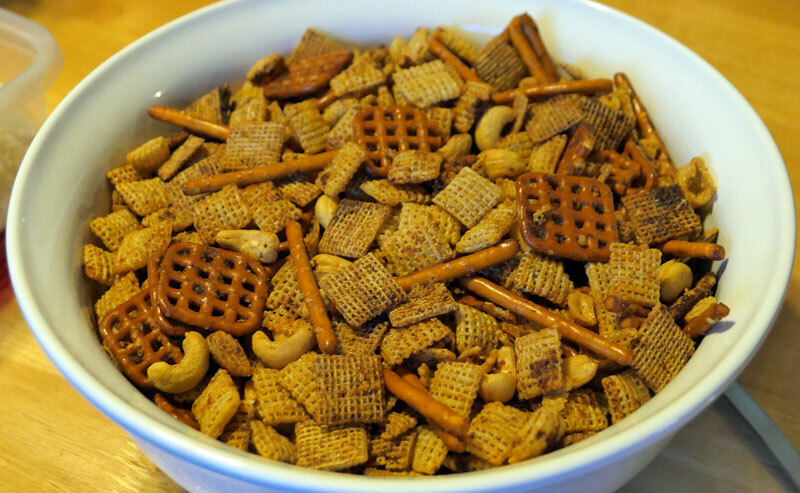 Spread Chex mix on a cookie sheet. Bake for 45 min. For dessert, Slynn and Ramon made us saffron cupcakes with cardamom vanilla frosting (inspired by this recipe). Their first batch of cupcakes, made with a new (to them) recipe, got very large in the oven then sunk down into an overly condensed form. 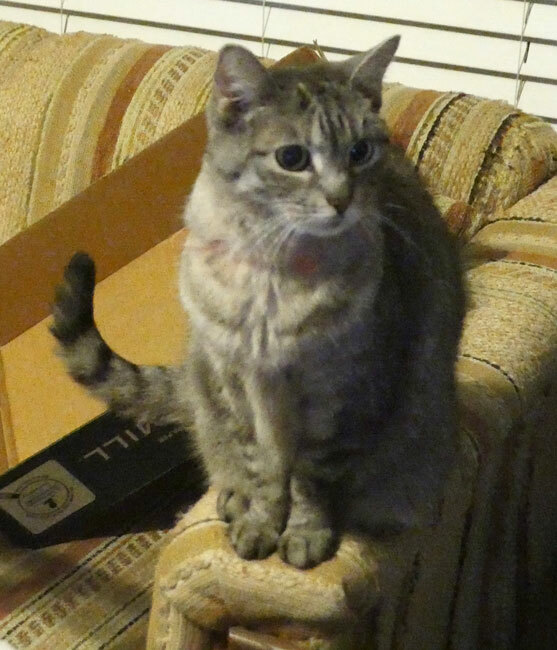 Slynn suspects the problem may have been too much liquid. 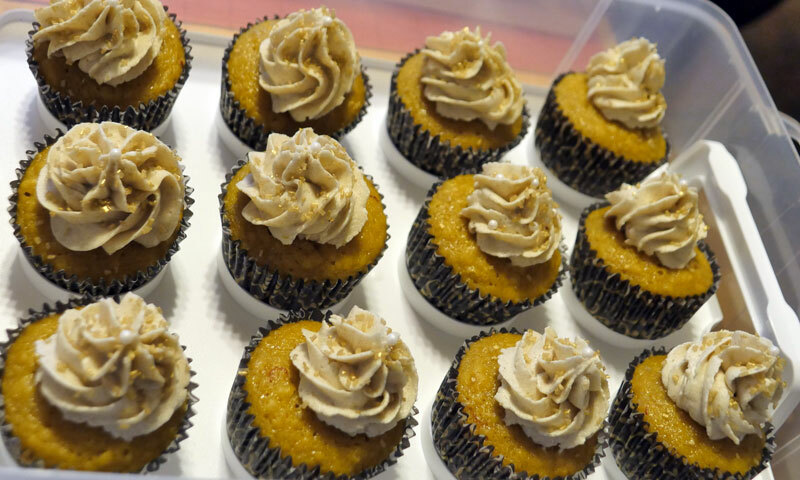 After the initial cupcake disappointment, they went to a recipe that Slynn has made several times, Golden Vanilla Cupcakes from Vegan Cupcakes Take Over the World, which they topped with cardamom vanilla frosting and sprinkled with gold sugar. Not to be wasteful, they made cake balls with the first set of condensed cupcakes plus coconut, golden raisins, and more of their cardamom vanilla frosting. Lauren made fiesta lasagna for this event mainly because it meant not going to the grocery store. She cooked some textured vegetable protein with black beans, Rotel tomatoes, corn, black olives, and onion. 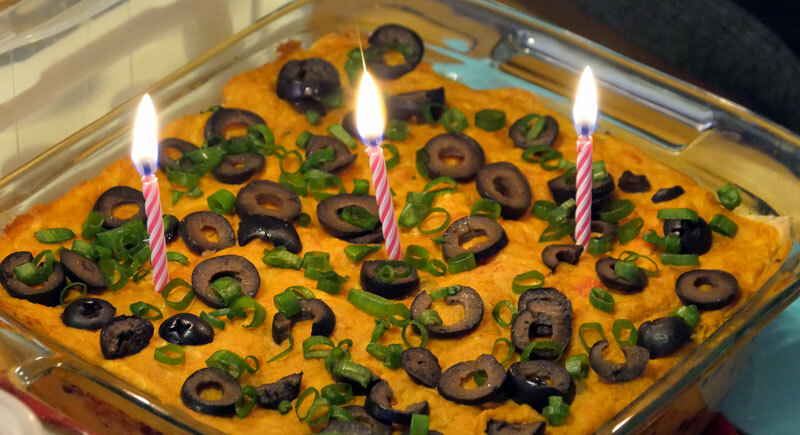 She layered the filling with a nutritional yeast based queso, and corn tortillas. She sprinkled the top with green onion and black olives. In honor of three years of Vegan Bake Club, John baked the vegan orange cake that many of us have enjoyed baking and eating together over the years. 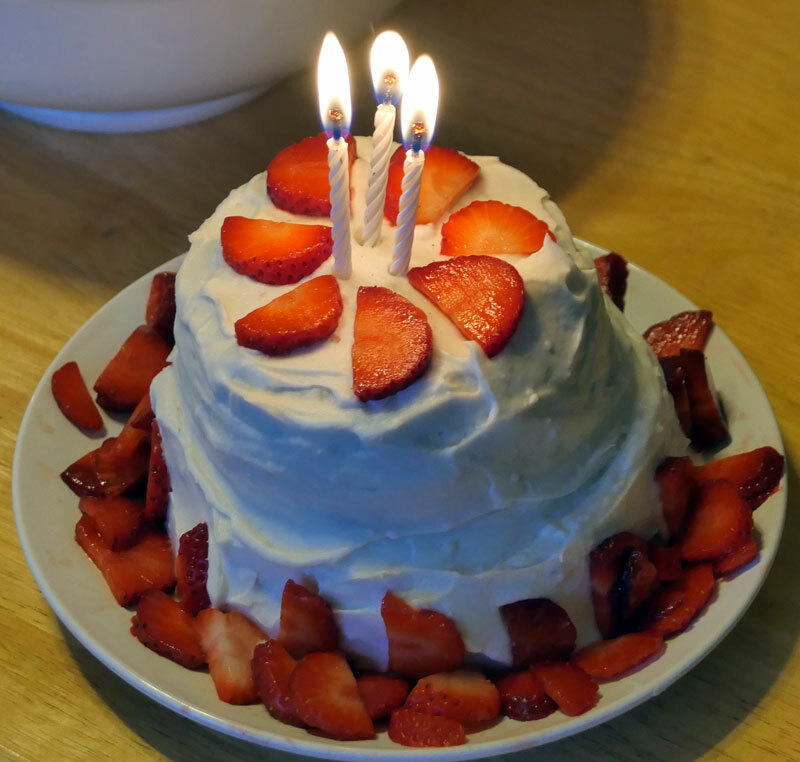 He dressed up the simple cake with coconut whipped cream and sliced strawberries. One Response to "March 27, 2016 – Three Year Anniversary Celebration"